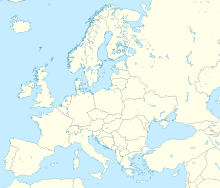 Manchester Airport (IATA: MAN, ICAO: EGCC) is an international airport at Ringway, Manchester, England, 7.5 nautical miles (13.9 km; 8.6 mi) south-west of Manchester city centre. In 2016, it was the third busiest airport in the United Kingdom in terms of passenger numbers and the busiest outside London. The airport comprises three passenger terminals and a goods terminal, and is the only airport in the UK other than Heathrow Airport to operate two runways over 3,280 yd (2,999 m) in length. Manchester Airport covers an area of 560 hectares (1,400 acres) and has flights to 199 destinations, placing the airport thirteenth globally for total destinations served. Officially opened on 25 June 1938, it was initially known as Ringway Airport, and is still called this locally. In the Second World War, as RAF Ringway, it was a base for the Royal Air Force. The airport is owned and managed by the Manchester Airports Group (MAG), a holding company owned by the Australian finance house IFM Investors and the ten metropolitan borough councils of Greater Manchester, with Manchester City Council owning the largest stake. Ringway, after which the airport was named, is a village with a few buildings and church at the southern edge of the airport. Future developments include the £800 million Manchester Airport City logistics, manufacturing, office and hotel space next to the airport. Ongoing and future transport improvements include the £290 million Eastern Link relief road, due to open in summer 2019. A High Speed 2 station known as Manchester Interchange, is earmarked for opening in 2033, and will directly connect the airport to Central London in under an hour and create a regular sub-10 minute shuttle service for connecting rail passengers from central Manchester to the Airport - relieving stress on the Styal Line to the Airport from Manchester which has become one of the most congested routes on the National Rail network. Construction started on 28 November 1935 and the airport opened partly in June 1937, and completely on 25 June 1938, in Ringway parish. Its northern border was Yewtree Lane between Firtree Farm and The Grange, east of the crossroads marked "Ringway", and its southeast border a little west of Altrincham Road, along the lane from Oversleyford running northeast then east into Styal. In the Second World War, RAF Ringway was important in military aircraft production and training parachutists. After the Second World War, the base reverted to a civilian airport and gradually expanded to its present size. 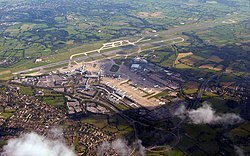 Manchester Airport was the busiest airport after Heathrow following the war. 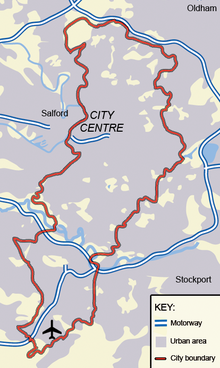 In 1972, the M56 motorway to the airport opened, and in 1993 Manchester Airport station. From 1997 to 2001, a second runway was built, causing large-scale protests in Cheshire, especially in the village of Styal where natural habitats were disturbed and listed buildings dismantled to make way for it. British Airways scaled down operations from Manchester Airport with the sale of their BA Connect subsidiary to Flybe, and the ending of their franchise agreement with GB Airways, a business subsequently sold to Easyjet. In October 2008, the daily New York–JFK service was also terminated and in March 2013 the frequent service to London–Gatwick. This leaves a BA Shuttle serving London Heathrow. American Airlines operations remain in Terminal 3, with daily flights to Philadelphia, but it has terminated services to New York, Chicago, and Charlotte, North Carolina. Since taking over BA Connect's select routes, Flybe has gone on to add several more destinations. In 2012, Flybe introduced the "mini hub" concept co-ordinating the arrival and departure times of various domestic services throughout the day and thereby creating combinations such as Norwich-Manchester-Belfast, Glasgow-Manchester-Southampton and Edinburgh-Manchester-Exeter with conveniently short transfer times. In 2013, Virgin Atlantic introduced its Little Red short-haul brand to take-up some of the available Heathrow and Gatwick slots. Manchester was the inaugural destination, with services were operated by aircraft leased from Aer Lingus. However, these services ceased in March 2015 due to low popularity. As of October 2017, there is a second London route by Flybe to London-Southend, operating up to thrice daily. As part of the Government's Future of Air Transport White Paper, Manchester Airport published its Master Plan on its proposed expansions until 2030. Demolition of older buildings, such as old storage buildings, the old Alpha Catering Building and Males Garage, to the east of Terminal 2 has already begun, to make way for a new apron and taxiway towards runway 05L/23R and an eastwards extension of Terminal 2, which is planned to provide fifteen more covered stands. A full-length parallel taxiway may be added to the second runway and more crossing points added across the first runway to improve ground movements of aircraft. The World Logistics Hub is also part of the Airport City Enterprise Developments in south Manchester. This development is designed to meet the growing demand for cargo handling space and infrastructure outside of the southeast. Positioned on the southwest side of the A538 road, next to the southeast side of the M56 motorway across the A538 from the World Freight Terminal, it provides access to the trunk motorway network via Junction 6. As the site grows, increased capacity will be added to the A538 with the extension of the dual carriageway between the M56 and runway tunnels and a traffic light controlled junction; improving access to the Runway Visitor Park and Romper pub. Manchester Airport has three passenger terminals (Terminals 1, 2 and 3). Terminals 1 and 2 are linked by the skylink, with travelators to aid passengers with the 10–15-minute walk. Terminal 3 is linked to Terminal 1 and the skylink by a covered walkway. The "skylink" also connects the terminals to the airport railway station complex (known as "The Station") and the Radisson BLU Hotel. The Skylink started construction in 1996 and opened 1997. Terminal 1 is used by airlines with scheduled and charter operations, flying to European and other worldwide destinations. It is the largest terminal at the airport. It was opened in 1962, by Prince Philip, the Duke of Edinburgh, and it is a base for EasyJet, Jet2 and Thomas Cook. Some other airlines that fly out of Terminal 1 include Aer Lingus, Air Transat, Brussels Airlines, Emirates, Etihad Airways, Lufthansa, Scandinavian Airlines, Swiss, TAP Portugal and Turkish Airlines. Terminal 1 is spread over an area of 110,000 m2 (1,200,000 sq ft). The terminal has 2 Piers of which combined have 29 stands, of which 15 have air bridges and is the largest of the three terminals. Gate 12 was specially adapted to accommodate the Airbus A380 which is operated by Emirates on their route three times per day from Dubai to Manchester. Terminal 1's current capacity is around 11 million passengers a year, compared with an annual capacity of 2.5 million passengers when it first opened. The first phase of the new extension, Pier 1, is due to open on 1 April 2019. Terminal 3 was opened in 1989 by Diana, Princess of Wales and had many names before final re-designation as Terminal 3 in May 1998. The terminal was known in succession as "Terminal A"; "Terminal A – Domestic"; "Terminal 1A" after Terminal 2 opened in 1993; "Terminal 1A – British Airways and Domestic"; "Terminal 3 – British Airways and Domestic" before becoming simply known as Terminal 3. In June 1998, British Airways opened their new £75 million terminal facility designed by Grimshaw Architects, this being a major extension to Terminal 3 and became the primary user of the terminal along with codeshare partner airlines (Oneworld Alliance). Terminal 3 now spreads over an area of 44,400 m2 (478,000 sq ft). Freight throughput at the airport grew from 94,000 tonnes in 1997 to the peak at 165,000 tonnes in 2007, but then declined to around 93,000 tonnes in 2013, subsequently increasing to over 109,000 tonnes in 2016 making Manchester the fourth-busiest UK airport for freight behind London Heathrow, East Midlands, and London Stansted airports. Manchester Airport railway station, opened in May 1993, is between Terminals 1 and 2. It is linked to the terminals by a Skylink moving walkway. Trains operated by Northern, TransPennine Express and Transport for Wales connect the airport to Manchester Piccadilly and other railway stations, mainly throughout northern England, including Crewe, Wigan and Southport, as well as Edinburgh and Glasgow in Scotland and Holyhead and Llandudno in Wales. A third rail platform was completed in 2008 to allow for an increase in rail capacity. In 2009, Network Rail stated that the third platform meant that capacity will become constrained by the layover of the trains and recommended building a line underneath the Airport towards Northwich by 2024. In January 2013, the Government announced that a Manchester Airport station on the North side of the M56 will be included in Phase 2 of High Speed 2 which will provide links with other British cities like Birmingham and London and also a quicker route into Central Manchester. Work on building a new fourth platform at the existing railway station commenced in early 2014 with a blockade required in February 2015 to allow completion. Construction finished in May 2015 and the platform opened to passengers in autumn 2015. A Metrolink service from Cornbrook station to the Airport opened in November 2014 and runs at 12-minute frequency. Journeys along the 15-stop line between Cornbrook take approximately 35 minutes. The Manchester Metrolink light rail system has had plans to extend to the airport for many years. When the idea of a congestion charge was mooted, part of the scheme was to have extended the Metrolink to the airport. However, when this was rejected the future of the scheme was in doubt. In 2009, it was announced that the line to the airport would finally be built. The airport line is one spur of the line from St Werburgh's Road, to East Didsbury and Manchester Airport, which opened on 3 November 2014 – 18 months ahead of schedule. As of January 2018, Metrolink services from the Airport operate to Manchester Victoria via Market Street. The Station is the airport's ground transport interchange and brings bus, coach and rail passengers under one roof. Over 300 trains, 100 coaches and 500 buses a day use the facility, including the 24-hour bus service 43, which runs every 10 minutes (every 30 minutes at night) to Manchester city centre via Wythenshawe, Northenden, Withington, Fallowfield and Rusholme. There is also Skyline service 199 operating every 30 minutes to Buxton via Stockport, Disley and Chapel-en-le-Frith, as well as a number of Stagecoach Manchester and Arriva North West services to Stockport, Altrincham and various parts of South Manchester. A network of National Express coach services serve Manchester Airport and operate to destinations further afield, including as far as Dublin. Parts of this article (those related to Progress on SEMMMS) need to be updated. Please update this article to reflect recent events or newly available information. Proposed as part of the SEMMMS (South East Manchester Multi-Modal Strategy) Relief Road Scheme, a new link road to the A6 south of Stockport opened in 2018. Planning permission had been granted, with inquiries for Compulsory Purchase and Side Roads Orders following up in September 2014. After significant delays, the link road opened on 15 October 2018. The airport's official short-stay car parking can be found in the multi-storey car parks adjacent to Terminals 1, 2 and 3. In July 2007 the airport introduced a 'No Waiting' restriction on all access roads surrounding the terminals. As of June 2018, the public are required to pay charges of £3 for five minutes on the terminal forecourt or £4 for the maximum ten minutes in order to drop off passengers. The charges have been highly controversial; local taxi drivers have described them as a "cash cow" for the airport, and were described by a judge for Minshull Street crown court as "extraordinary" and "an absolute disgrace" after he gave a psychology teacher a suspended sentence for deliberately driving into a parking official in an act of road rage over the charges. In 2007 Manchester Airport applied to build on land in Styal to increase its car parking. However, the former Macclesfield Borough Council refused to give them planning permission to do so and expressed annoyance at the airport for not investing enough in public transport. A former RAF Hawker Siddeley Nimrod aircraft. The aircraft was moved into place in April 2010. 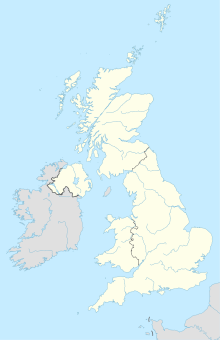 ^ "Flybe becomes independent carrier to create regional network hub in UK". Archived from the original on 23 July 2015. Retrieved 2 June 2015. ^ a b c "Manchester – EGCC". Nats-uk.ead-it.com. Retrieved 4 April 2010. ^ a b c d e f g h "Aircraft and passenger traffic data from UK airports". UK Civil Aviation Authority. 11 March 2017. Retrieved 11 March 2017. ^ "Live Search Maps". Microsoft. ^ "Manchester Airport is 'ready' for A380 Super Jumbo". BBC News. 19 August 2010. Retrieved 1 September 2010. ^ "Frankfurt with almost 300 destinations and Paris CDG with over 100 airlines lead global analysis of airport operations in S17". anna aero. 15 February 2017. Retrieved 12 March 2017. ^ "One Year on Site". Manchester Airport. 17 August 2018. ^ "Transport Committee Written evidence from Manchester Airports Group (AS 44)". Parliament of the United Kingdom. 19 October 2012. Retrieved 16 August 2013. ^ "Wayback Machine". 19 March 2015. Archived from the original on 19 March 2015. ^ McKeegan, Alice (18 February 2011). "Video and pictures: Manchester Airport's runway protestors reunited 14 years on". Manchestereveingnews.co.uk. Retrieved 21 September 2018. ^ "Manchester's second runway ready for take-off". Telegraph.co.uk. 12 December 2000. Retrieved 21 September 2018. ^ "AirportWatch - History of the Manchester Airport second runway battle". Airportwatch.org.uk. Retrieved 21 September 2018. ^ "US Airways - Route map". Retrieved 2 June 2015. ^ "US Airways draft summer schedule to Europe out - The Meck Deck". Archived from the original on 12 September 2015. Retrieved 2 June 2015. ^ "Corporate Media News archive". Flybe. 8 March 2012. Archived from the original on 1 July 2012. Retrieved 1 February 2013. ^ "Little Red". Virgin Atlantic. Retrieved 23 January 2016. ^ Craig, Jeananne (2 July 2009). "Manchester airport terminal relaunched after £50m facelift". The Independent. Retrieved 3 April 2016. ^ a b c "masterplan – jan – new" (PDF). Archived from the original (PDF) on 27 March 2009. Retrieved 4 April 2010. ^ "Manchester Airport £50m overhaul complete". UK Airport News. Archived from the original on 21 July 2011. Retrieved 4 July 2009. ^ "Massiver Ausbau: Manchester will besser als Heathrow werden". aerotelegraph.com. 9 June 2015. ^ "Manchester Airport: £1bn plan to 'transform' site launched". BBC News. Retrieved 2 June 2015. ^ "Manchester Airport on Twitter". Twitter. Retrieved 21 September 2018. ^ "One-to-one with Robert Smith, Head of Aviation Development, Manchester Airport". anna.aero. 20 February 2019. ^ "Air Arabia Maroc launches Agadir base from Oct 2017". Routesonline.com. ^ "Flights with TUI - Thomson now TUI Airways". Thomson.co.uk. ^ "Skicharter: Austrian fliegt 27.000 Reisende nach Tirol". www.austrianaviation.net. ^ "British Airways adds new London City / Manchester routes in W17". routesonline.com. ^ "British Airways - LAUNCH OF SEVEN NEW ROUTES FROM MANCHESTER". Mediacentre.britishairways.com. ^ "ADS Advance - BA extends services from Manchester Airport". Adsadvance.co.uk. ^ a b c d e f "New routes from the UK". www.easyjet.com. ^ a b c d "Home | easyJet.com". www.easyjet.com. ^ "Ethiopian updates planned European changes from Dec 2018". Routesonline.com. Retrieved 21 September 2018. ^ "Cheap Flights & Low Cost Flight Tickets - Flybe UK". Flybe.com. ^ "Flight Timetables - Jet2.com". Jet2.com. Retrieved 21 September 2018. ^ "Jet2.com adds Manchester – La Rochelle link in May 2019". Routesonline.com. Retrieved 21 September 2018. ^ "Double delight as two brand new destinations launch for Summer 20 | Jet2.com". www.jet2.com. ^ "Cheap Flights | Find & Book Cheap Flights Online | Jet2.com". www.jet2.com. ^ "New Routes 2018 - Loganair". Loganair.co.uk. Retrieved 21 September 2018. ^ Ltd. 2019, UBM (UK). "Pegasus Airlines adds Istanbul – Manchester link from July 2019". Routesonline. ^ a b c d e f g "Ryanair Announces $300m Additional Investment With 3 New Aircraft At Manchester - Ryanair's Corporate Website". Corporate.ryanair.com. ^ "Ryanair cresce a Malpensa, 20 rotte per l'inverno 2019 - IlGiornale.it". m.ilgiornale.it. ^ "Book cheap flights using Fare Finder | Ryanair". www.ryanair.com. ^ "Ryanair Launches New Manchester Route To Poitiers | Ryanair's Corporate Website". ^ Godfrey, Kara (22 August 2017). "Thomas Cook relaunch flights to Tunisia - two years after beach terror attack". Express.co.uk. ^ "OAG Flight Tools - Which Airlines fly my route". Flighttools.oag.com. Retrieved 21 September 2018. ^ "Book & Plan". Thomascookairlines.com. ^ "Thomas Cook UK plans Manchester – Montego Bay launch in May 2019". Routesonline.com. Retrieved 21 September 2018. ^ "Thomas Cook to launch new US route from Manchester". Travelmole.com. Retrieved 21 September 2018. ^ "17 new routes, seven new own-brand hotels for Summer 2018 on sale". Thomascookairlinesuk-newsroom.condor.com. ^ "Flight Timetable | TUI Airways". www.tui.co.uk. ^ a b c d e "Ski Holidays 2017/2018 - Get More Winter With Crystal Ski". Crystal Ski. ^ "Virgin Atlantic Adds Manchester - New York Service from May 2017". routesonline.com. ^ "Virgin Atlantic adds Manchester – Los Angeles service from May 2019". Routesonline.com. Retrieved 21 September 2018. ^ "Etihad marks two more Manchester milestones". Etihad Airways. 1 October 2011. Archived from the original on 22 January 2013. Retrieved 11 March 2012. ^ a b "World Freight Terminal". Manchester Airport. Retrieved 1 February 2013. ^ "Wayback Machine". 3 March 2016. Archived from the original on 3 March 2016. ^ a b c "Fact Sheet: Airport Summary". Manchester Airport. Archived from the original on 11 March 2012. Retrieved 4 April 2010. ^ "Flight path to destruction" (PDF). Archived from the original (PDF) on 23 June 2006. ^ a b "Knutsford Guardian – Residents wait for airport to pay out". Archive.knutsfordguardian.co.uk. 19 December 2007. Archived from the original on 2 March 2009. Retrieved 4 April 2010. ^ "Airport extends second runway opening hours to cope with demand". Manchester Evening News. Retrieved 14 May 2014. ^ "Manchester Airport's new £20 million control tower is complete". Manchester Airport. 25 June 2013. Archived from the original on 2 April 2017. Retrieved 9 July 2013. ^ "Test exposes airport security lapse". BBC. 9 February 2002. Retrieved 4 November 2007. ^ "BBC finds airport security lapses". BBC. 5 September 2004. Retrieved 4 November 2007. ^ "Man detained after airport alert". BBC News. 23 September 2005. Retrieved 4 November 2007. ^ "Airport arrest man in court on terror charges". The Guardian. London. 15 June 2006. Retrieved 4 November 2007. ^ "Boy, 11, boards plane to Italy at Manchester Airport without passport". BBC News. 25 July 2012. Retrieved 5 September 2012. ^ "Military jet escorts Qatar Airways plane to Manchester Airport". BBC News. Retrieved 2 June 2015. ^ "Connecting local communities" (PDF). Retrieved 1 February 2013. ^ "And then there were 4". Railengineer.uk. ^ "Manchester Airport rail station's fourth platform completed ahead of schedule". Manchestereveningnews.co.uk. ^ "Manchester Airport Metrolink tram line completed early". BBC News. 20 June 2014. Retrieved 6 August 2014. ^ "Airport line". TfGM. Archived from the original on 20 May 2013. Retrieved 6 August 2014. ^ "Service 43 timetable" (PDF). Transport for Greater Manchester. Archived from the original (PDF) on 1 June 2011. Retrieved 11 May 2011. ^ "A6MARR Overview - SEMMMS". Semmms.info. Retrieved 21 September 2018. ^ "A6 to Manchester Airport Relief Road opening date announced | SEMMMS". ^ Butler, Katie (21 March 2018). "Taxi drivers say new airport drop-off charges are a 'cash cow'". Manchester Evening News. Retrieved 21 September 2018. ^ "Official website for Manchester Airport, live flight information, car parking & booking flights - Manchester Airport". Retrieved 2 June 2015. ^ "Pick Up & Drop Off Information & Charges - Manchester Airport". Manchester Airport. Retrieved 21 September 2018. ^ "Free Drop-Off Terms and Conditions - Manchester Airport". Manchester Airport. Retrieved 21 September 2018. ^ Cox, Charlotte (13 July 2018). "Drivers claim Manchester Airport drop-off charging is causing MORE gridlock". manchestereveningnews.co.uk. Retrieved 21 September 2018. ^ "Airports now charge up to £4.50 for a 10-min drop-off - how to avoid 'kiss and fly' fees". Moneysavingexpert.com. Retrieved 21 September 2018. ^ "Save Arthurs wood Press statements". Retrieved 31 December 2006. ^ "Victory for green belt campaigners as airport's plan for Styal is rejected". Wilmslow Express. Retrieved 9 November 2007. ^ "AeroTransport Data Bank". Aerotransport.org. 19 December 2011. Retrieved 1 February 2013. ^ "ASN Aircraft accident Douglas C-47A-75-DL Dakota 3 G-AJVZ Manchester-Ringway Airport (MAN)". Aviation-safety.net. Retrieved 4 April 2010. ^ "British Air Tours KT28M air crash". Pilotfriend.com. 22 August 1985. Retrieved 4 April 2010. ^ "Service held to mark 1985 Manchester air disaster". BBC News. 22 August 2010. Retrieved 18 November 2015. ^ "Jet disaster survivors meet pilot 25 years on". Manchester Evening News. 23 August 2010. Retrieved 18 February 2012. ^ "Guide to Manchester Airport". Plane Mad. Retrieved 27 April 2012. Out of all UK airports, Manchester is probably the best for viewing and photography with many very good spots. ^ "Lowry Tops Visitor Attraction Figures in Greater Manchester". Manchester Confidential. 29 November 2011. Archived from the original on 17 June 2013. Retrieved 5 September 2012. ^ "Airport newts halt Concorde home". BBC News. 19 September 2008. ^ "RAF Nimrod MR2 XV231". Manchester Airport. 27 April 2012. Archived from the original on 28 December 2011. Retrieved 27 April 2012.